A native of Syracuse, New York, Chris Short earned a Bachelor of Music in Violin Performance from Ithaca College. 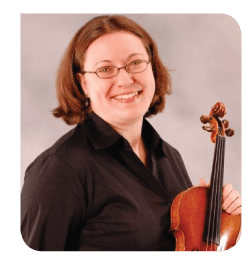 After several years of non-musical work, she returned to the violin in 2004 and completed a Master of Music in Violin Performance at the University of Colorado-Boulder in 2006. She joined the Fort Collins Symphony as Assistant Principal Second Violin that year, along with the Cheyenne Symphony Orchestra and Greeley Philharmonic Orchestra. Chris was a founding member of the MEO String Quartet, a Boulder-based group focused on educational outreach, and the Penumbra Quartet. Currently she performs with the Sphere Ensemble, which is a 13-member self-conducted string orchestra based in the Denver area. Chris has also performed with the Boulder Philharmonic Orchestra and Colorado Music Festival, and will perform with Opera Colorado this spring. With the Mont Alto Motion Picture Orchestra, she has traveled to San Francisco, Chicago, and Nebraska to accompany silent films. She has been heard on Colorado Public Radio with the Penumbra Quartet, Sphere Ensemble, and Telling Stories. In addition to performing regularly, Chris teaches private violin and viola lessons to a growing number of young musicians. She is also the orchestra librarian for the Greeley Philharmonic, Colorado Music Festival, and Summer Choralfest. Chris resides in Northglenn with her husband, Fort Collins Symphony cellist David Short, and their two cats.